In our continual efforts to keep growing the brand and make the product more available to customers we are glad to announce a new partnership in California with Scott Benedettini. Scott brings his expertise in the restaurant business to the Taco Jesus team and can help service the state and bring our products to retailers and restaurants near you. 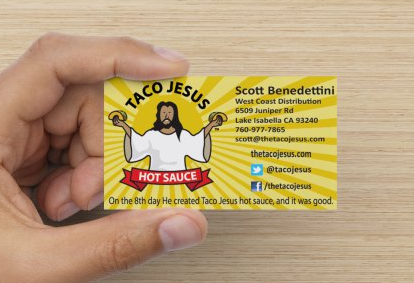 If you are in the Golden State and are interested in offering the Taco Jesus line of products Scott will offer the personal service that is making our brand famous.